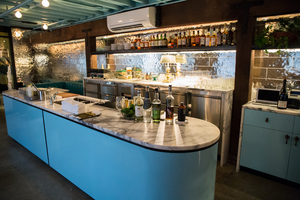 The new basement bar at LihoLiho Yacht Club, Louie’s Gen-Gen Room. Photo: Medium Raw Arts. The beautiful bar. Photo: Medium Raw Arts. 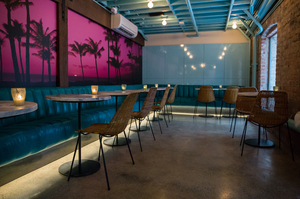 And now the folks at ~LIHOLIHO YACHT CLUB~ are giving us yet another reason to come by their ever-hot and packed place: they have opened a bar in the basement called ~LOUIE’S GEN-GEN ROOM~. But it won’t get too crazy down there: the space is reservation only, with a completely different cocktail and food menu than upstairs. Take a look at the menu here, which has snacks from chef Ravi Kapur like potato chips with French onion, egg, chives, and hello smoked trout caviar ($12.50); furikake waffle with uni, avocado, toasted walnuts ($18.50); and grilled cheese with Nicasio Square, black truffle, and maple butter ($12.50). Cocktails from Yanni Kehagiaras range from $12-$15, and include The Last Mango in Paris (LOL). The 24-seat space got its name from the space’s former incarnation as Louie’s Market (as for Gen-Gen, it’s a made-up word because they liked the name The Genuine but wanted something more fun). Cheers! Specials are updated on Gen-Gen’s Instagram: @louiesgengenroom. 871 Sutter St. at Leavenworth.